How to add keyboard shortcut for Tomboy 'create new note'? I'm on Linux Mint and I use Tomboy Notes a lot. I want to add a custom keyboard shortcut to instantly open a 'new note' window and start typing. I've already created a custom keyboard shortcut for Tomboy but that basically launches the main search window rather than creating a new note for me to start typing immediately. Is there a way I can achieve that? I've searched online and found different commands for Tomboy e.g. 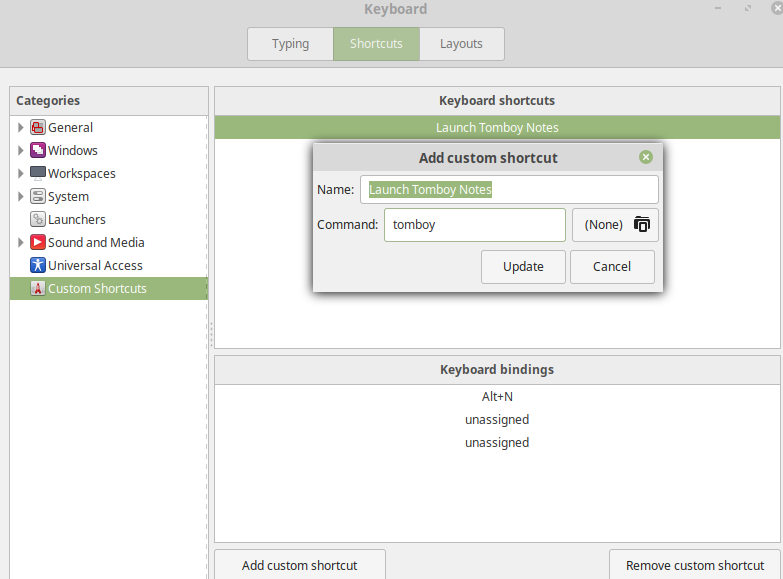 'tomboy --search' but not for instant note creation. Ah I've managed to work it out and since there are no other answers yet, I thought I might as well post my solution here in case anyone else is interested. So basically, in the "Add custom shortcut" command section I had to type "tomboy --new-note" rather than just "tomboy". If you are not aware of certain command options supported by a program, you can simply type in your terminal "[program name] --help" and it will list them all out for you. Tomboy: A simple, easy to use desktop note-taking application. --help            Print this usage message. --note-path [path]        Load/store note data in this directory. --search [text]       Open the search all notes window with the search text. --new-note            Create and display a new note. --new-note [title]        Create and display a new note, with a title. --open-note [title/url]   Display the existing note matching title. --start-here          Display the 'Start Here' note. --highlight-search [text] Search and highlight text in the opened note. --addin:html-export-all [path]    Exports all notes to HTML in the given location. --addin:html-export-all-quit [path]   Exports all notes to HTML in the given location and then quits. Not the answer you're looking for? Browse other questions tagged linux-mint keyboard-shortcuts or ask your own question. How can I add a keyboard shortcut from the command-line or by editing a file?